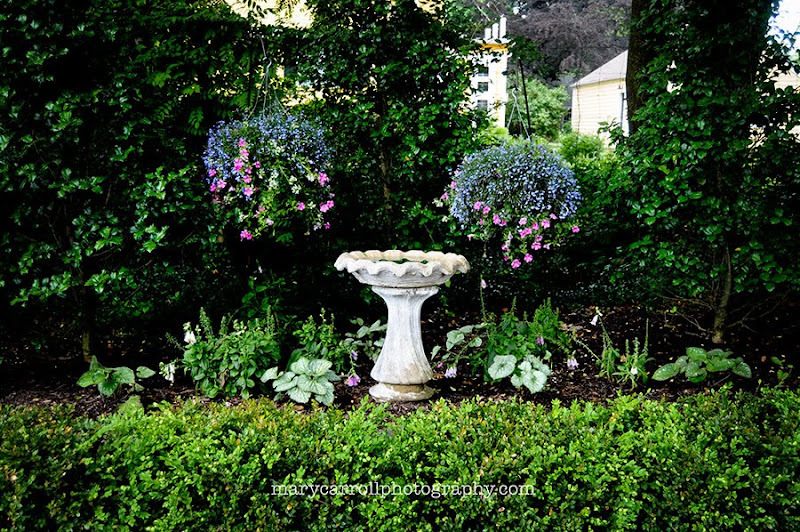 Now, about these photos... you had to know that I couldn't go long without posting a garden, right? 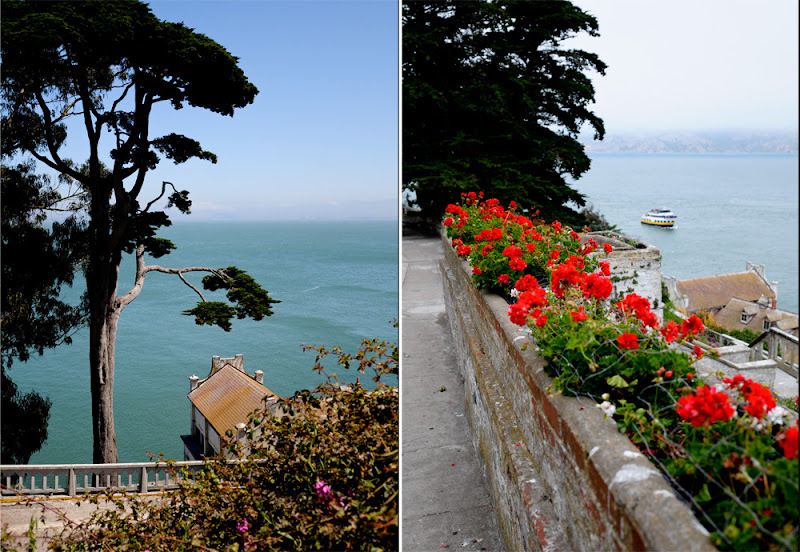 There is actually quite a beautiful garden at Alcatraz in San Francisco. 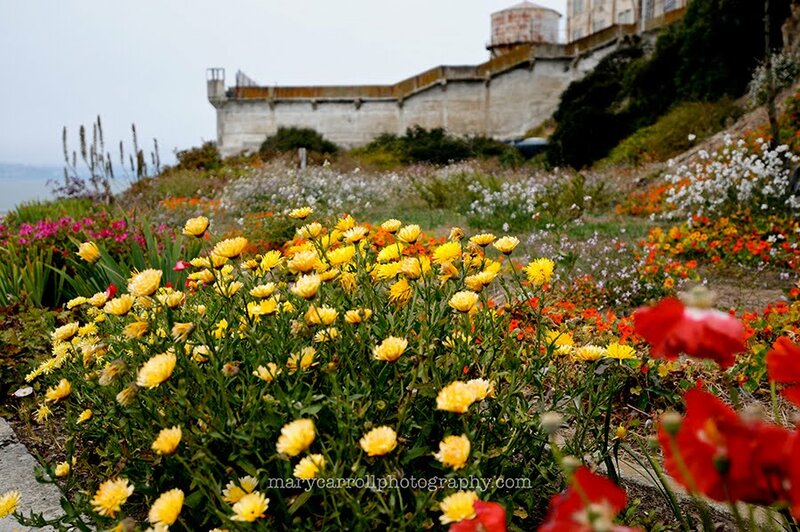 The juxtaposition of colorful blooms and forbidding prison buildings makes for a very interesting combination. 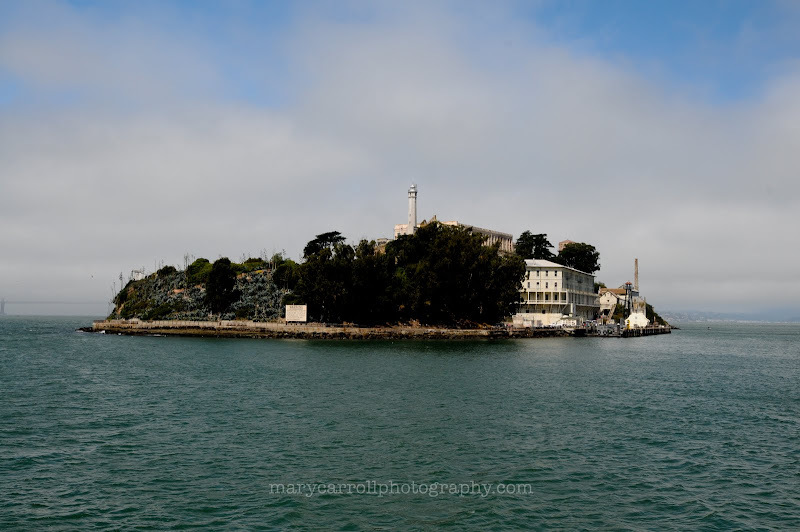 And of course, since Alcatraz is an island, views of the water are never far away. Greetings, peeps! I just wanted to touch base with you all before Sunday. Here in New Jersey, we are expecting Hurricane Irene to arrive sometime between tonight and tomorrow morning. There is a distinct possibility that we will lose power and/or internet access at some point. So if you don't see Mosaic Monday here at the usual time on Sunday night, that is the reason. So, can you guess where I was last week? Yes, that's right. 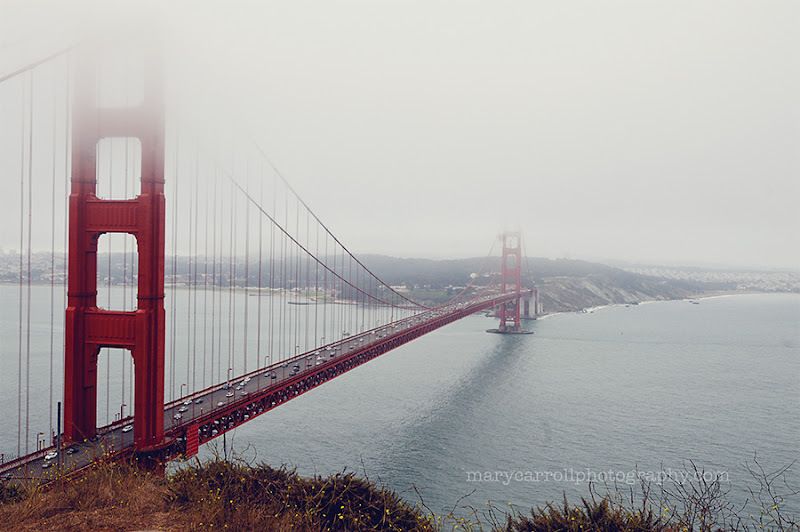 And I definitely left my heart in San Francisco... It was cool, and misty, and totally marvelous! 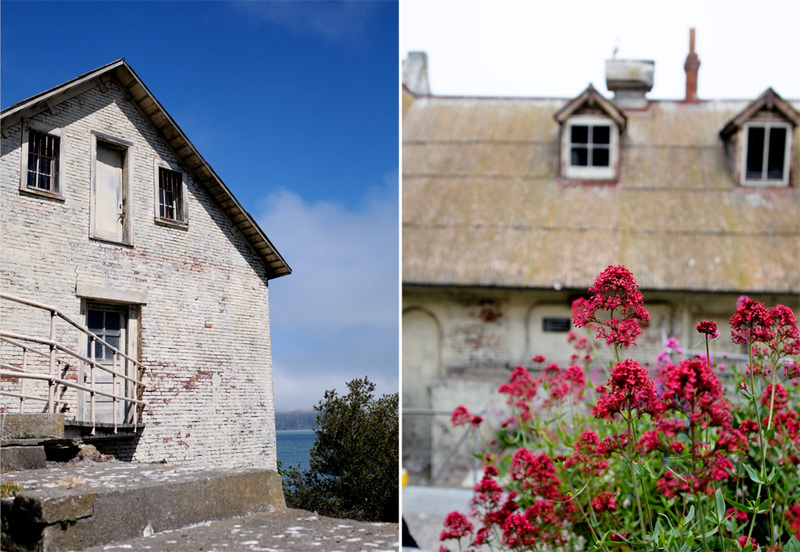 And wow, it was incredibly windy on the Marin Headlands the day we visited (see photo above). After temperatures in the 90's and 100's in New Jersey, we really enjoyed the typical late summer cool weather in San Francisco. There was fog every day, although on some days it burned off by the afternoon. But I love fog! It certainly makes for some great photo opportunities. 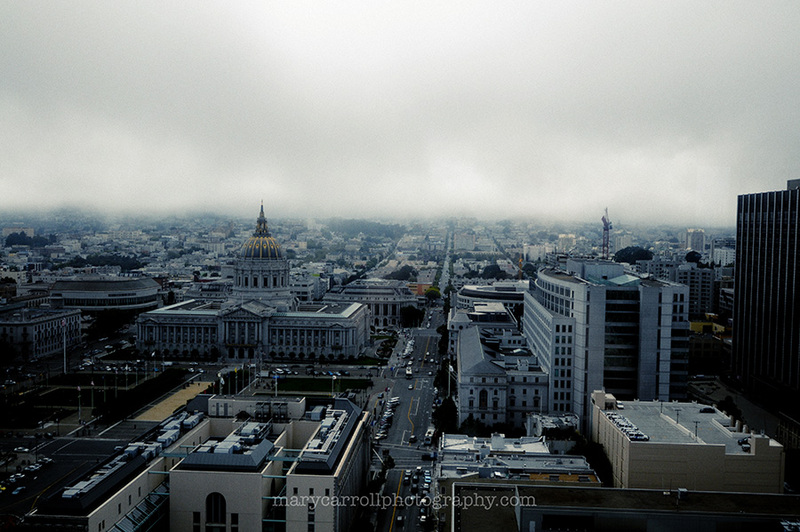 The view of San Francisco's city hall (above) was taken from the top of a building at UC Hasting's Law School. We went to check it out for my daughter, who wants to go to law school after she graduates. 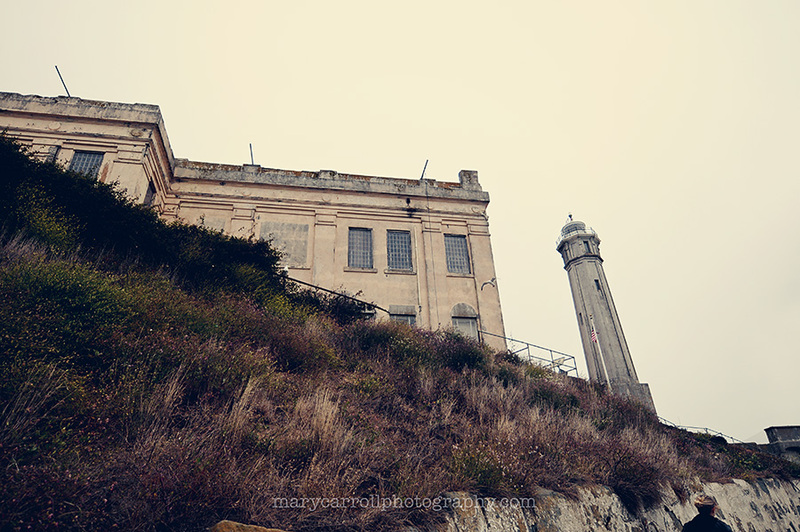 We spent a morning visiting Alcatraz, too. I took hundreds of photos, so that will have to be a post all by itself. 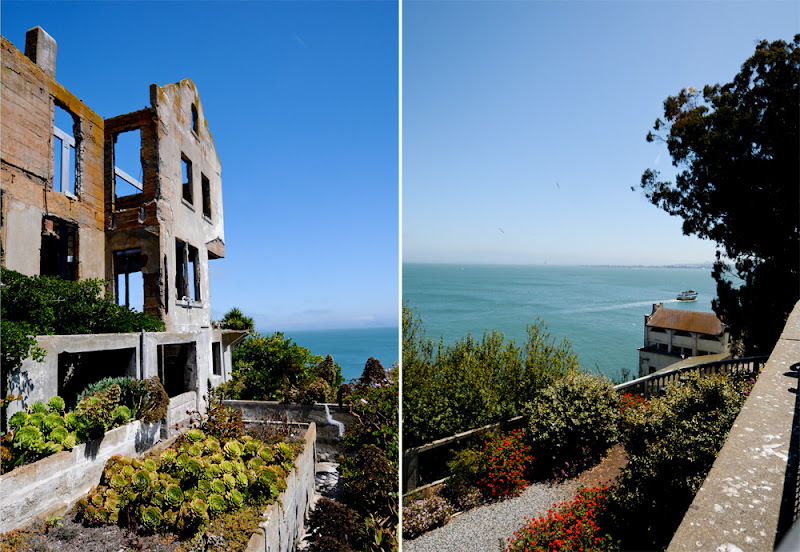 I was so inspired by this spare, windswept island, with it's imposing and stark buildings. Finally, I have to say that the "mellow" California stereotype is well-deserved. 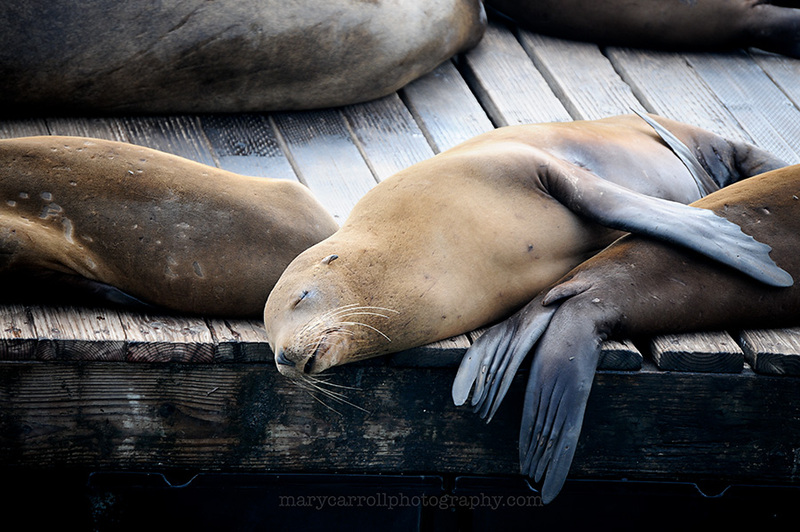 :) Actually, these sea lions at Pier 39 on the Embarcadero were not the only mellow creatures we spotted. The very first thing that we all noticed was the fact that California drivers actually stop for you when you are in the crosswalk. I cannot tell you how totally alien this idea was to us. Here in New Jersey, drivers speed up to hit you when you're in the crosswalk. 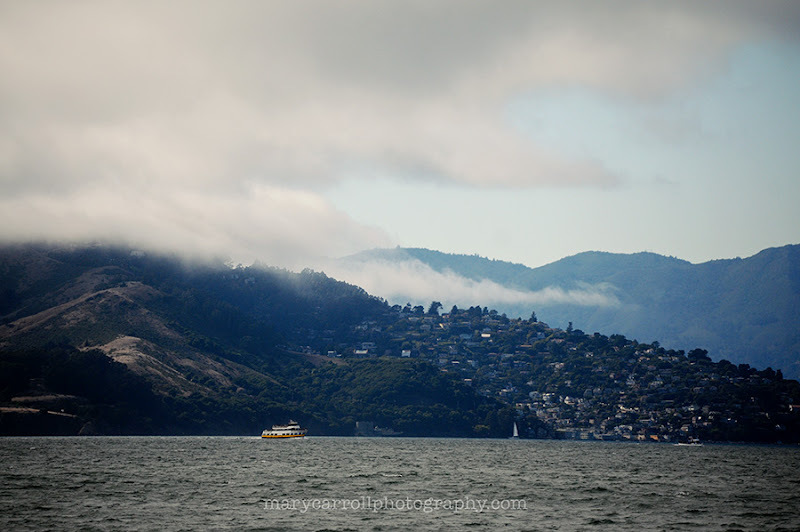 So, much more San Francisco photos over the next week. I'm so happy to be back and sharing with you once more. And I just have to take a moment to point out one of life's little ironies -- the day we returned from San Francisco, we had an honest-to-goodness earthquake on the East Coast. How strange is that? Welcome to August in New Jersey. 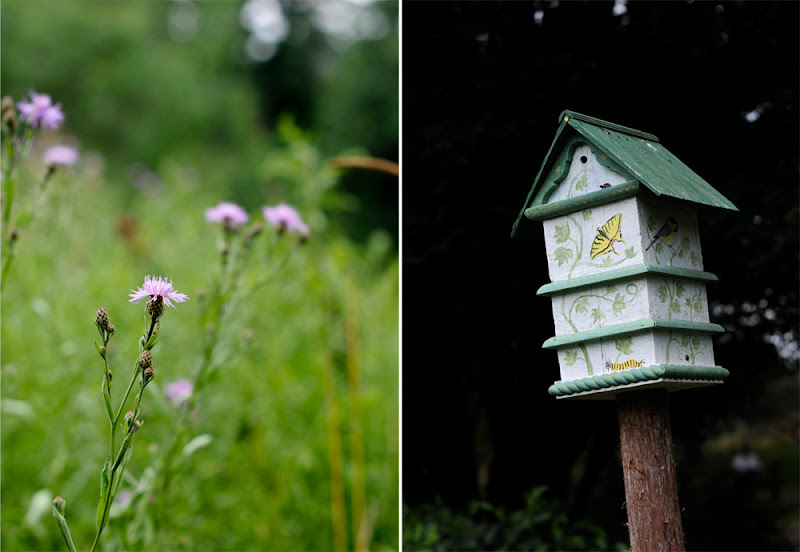 Actually, these photos may have been taken at the end of July, but let us not quibble over a few days. 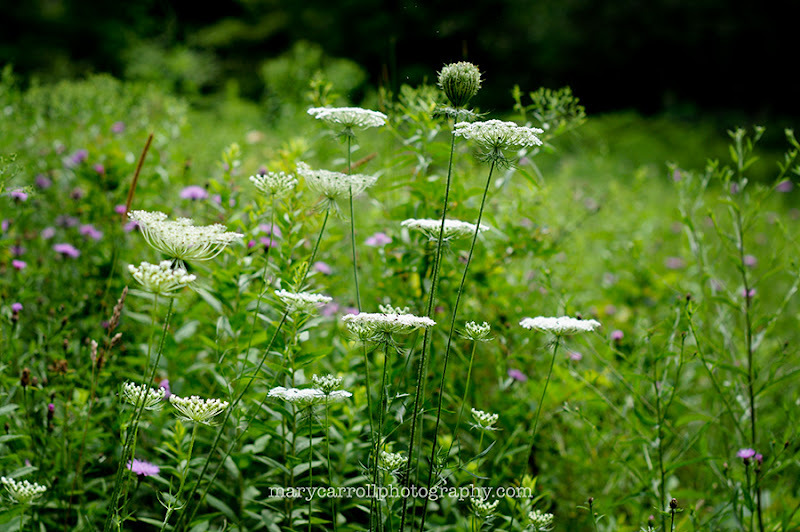 This is what August in New Jersey looks like -- the fields are filled with thistle and asters and queen anne's lace. 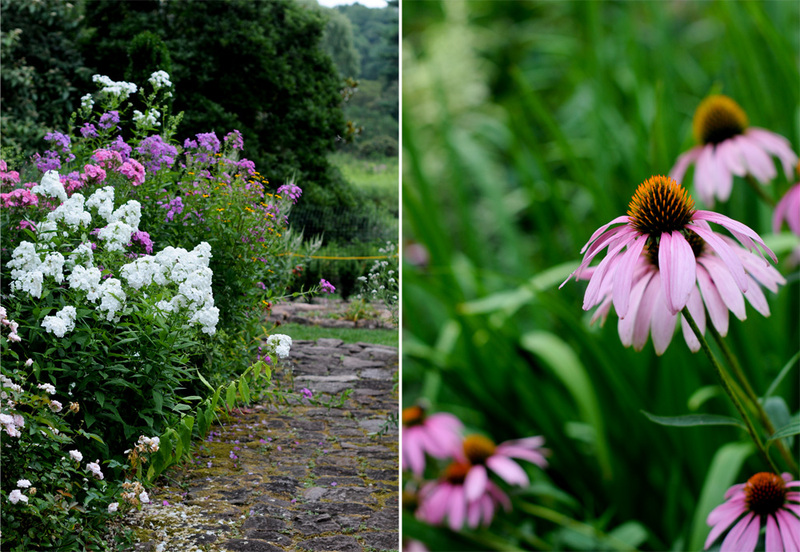 And if you are lucky, your garden is filled with phlox and echinacea. 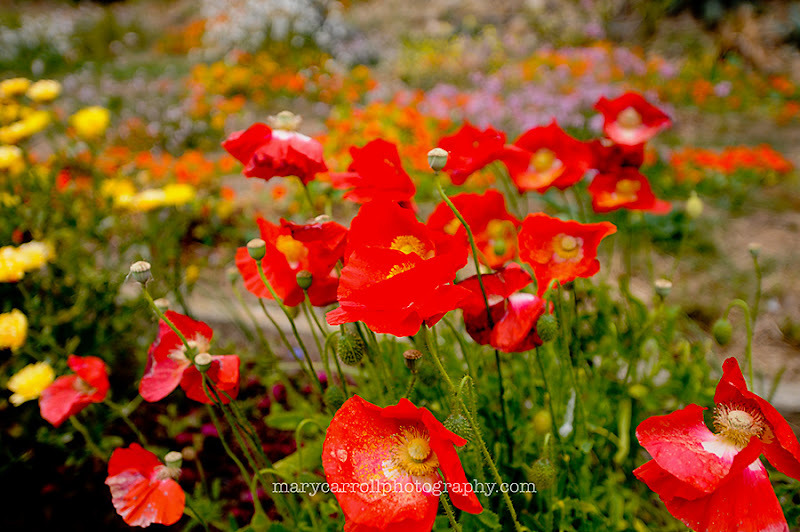 My garden is actually filled with weeds. 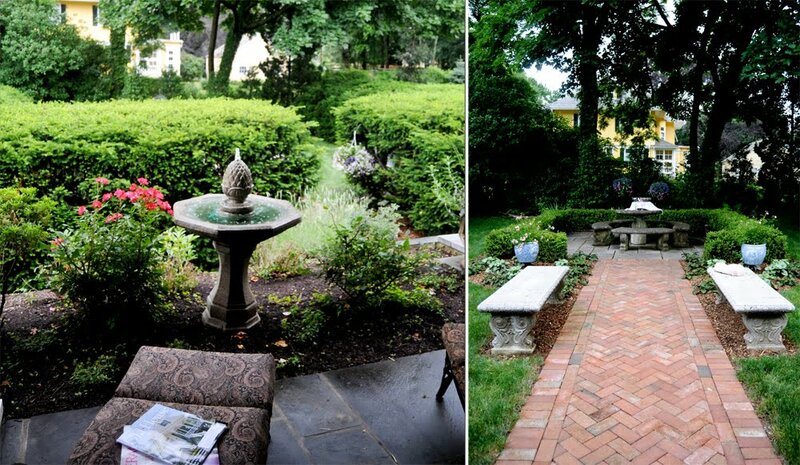 But this lovely garden is about twenty minutes away. 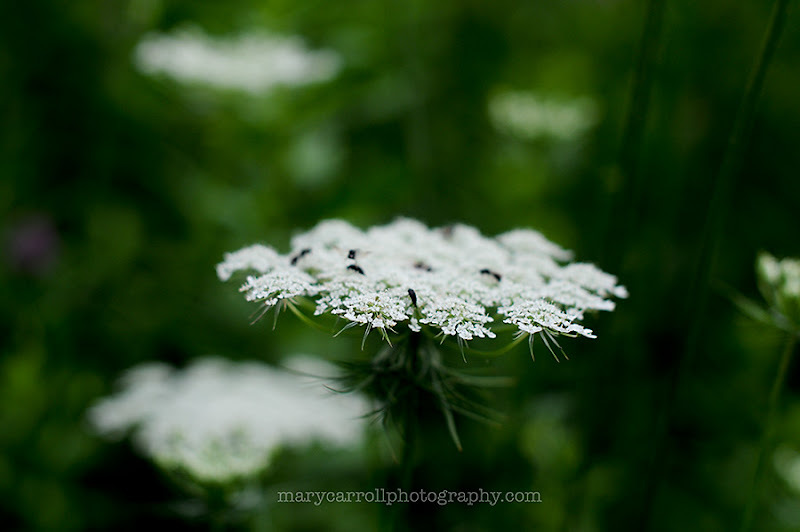 It is called Willowwood, and is maintained by the Morris County Parks system. Last year, I posted about it here, and here. Please Note: Next week there will be no Mosaic Monday. I will be taking a week away from the computer, to celebrate my husband's birthday, to get my new business going, and to enjoy the last days of summer with my daughter before she returns to school. Enjoy your week! 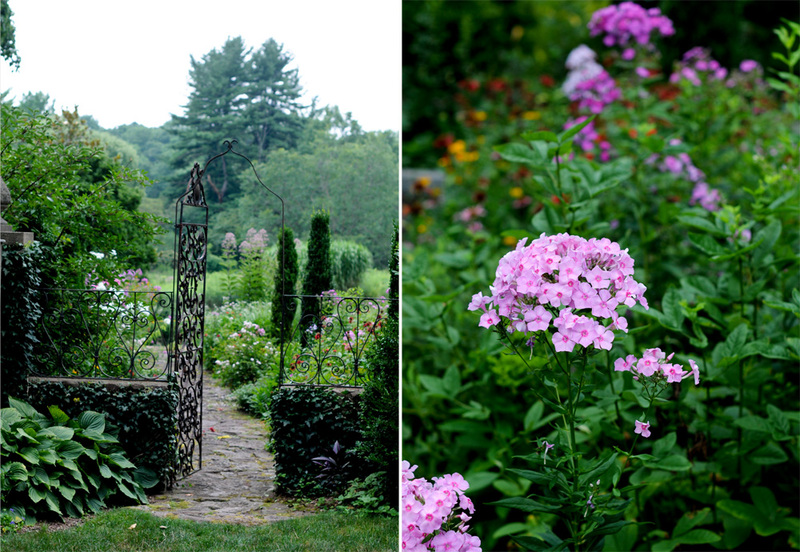 The photos here were taken way back in June, at a local garden tour in a nearby town. 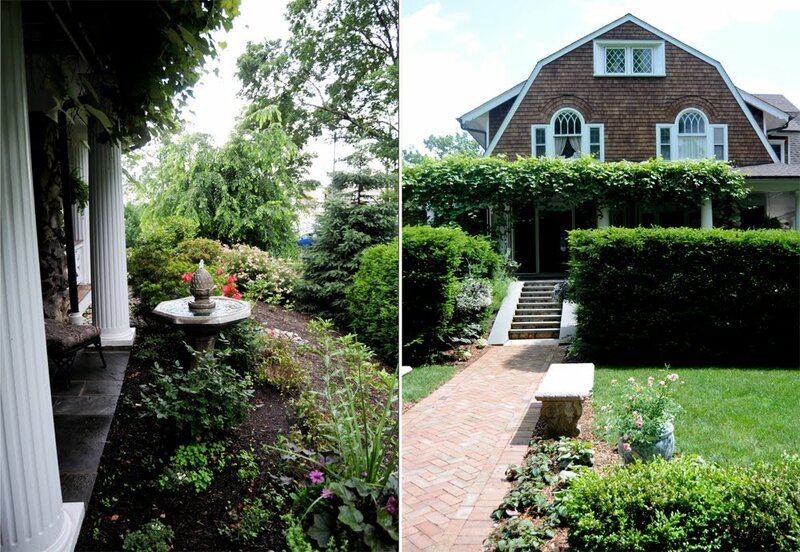 I love this shingle-style home, built in 1904. You can see the side view in the photos above. 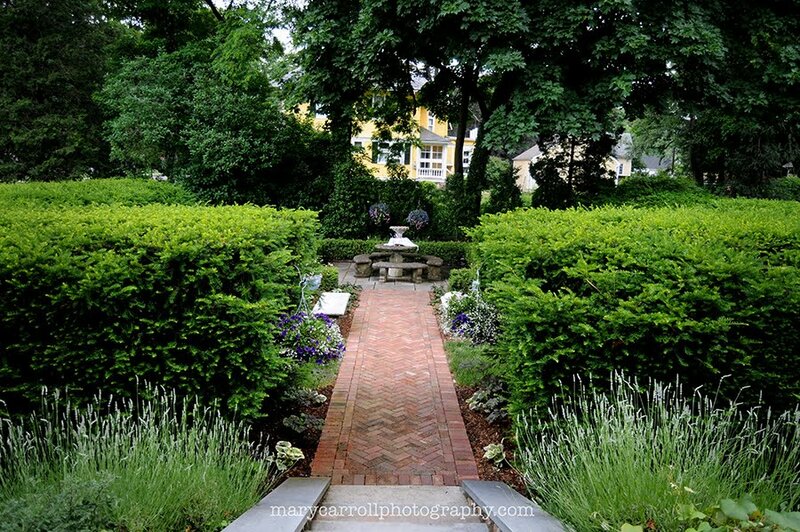 I felt uncomfortable taking a picture of the front, as the owner was on the front porch greeting garden visitors. The side view of the house does give you an idea of what a beautiful house it is, though -- don't you just love those windows? 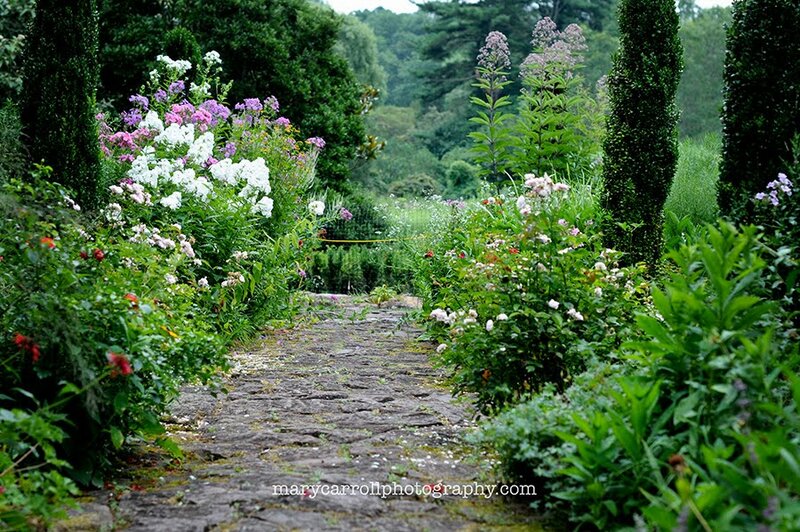 The garden itself was rather formal, with a brick path leading to a small stone bench encircled by a yew hedge. 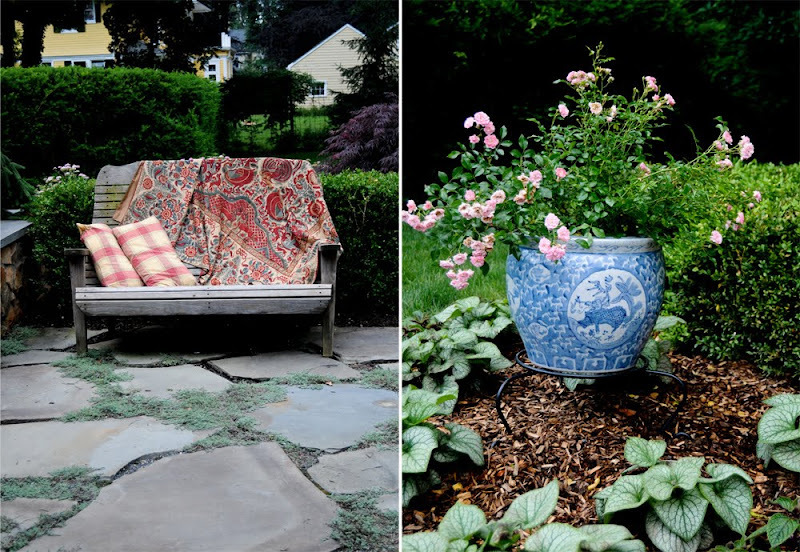 There were lovely decorative touches throughout, including a pair of blue and white Chinese jars planted with roses, and an elegant fountain just off the side porch. And do you see what was parked in the driveway?! 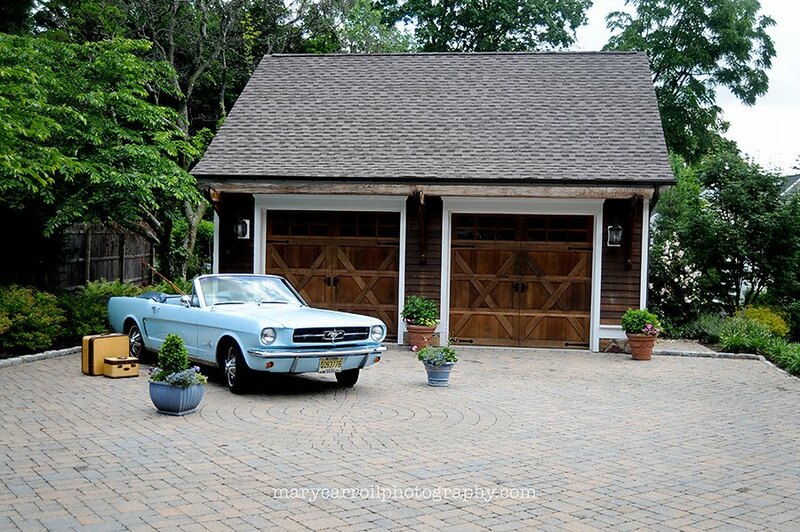 A vintage baby blue Mustang! How cool is that?? ?